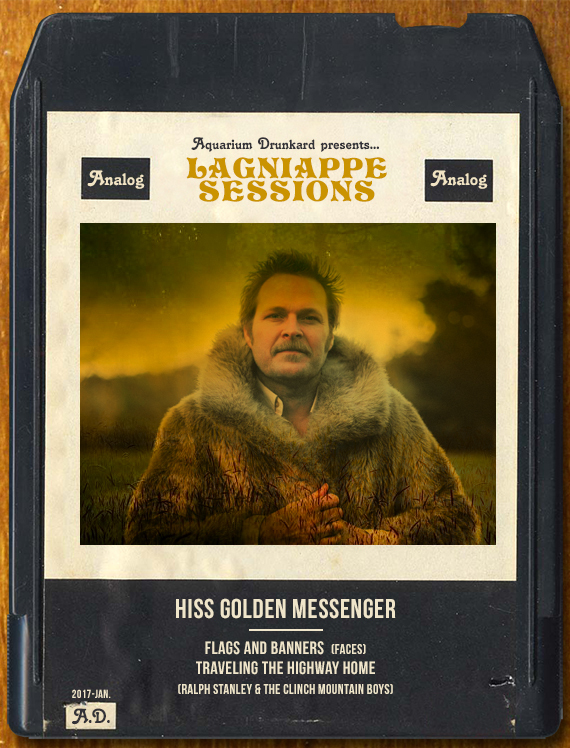 For this installment of the Lagniappe Sessions Hiss Golden Messenger headed to Fivethirteen Recording in Tempe, Arizona, to lay down the gospel standard “Traveling the Highway Home” and the Faces’ “Flags and Banners.” Hiss Golden Messenger’s M.C. Taylor, in his own words, below. “Flags and Banners” is a tune co-written by Rod Stewart and Ronnie Lane. It appears on the Faces album Ooh La La, though my favorite version of it appears on a compilation of BBC recordings that Ronnie made with his band Slim Chance after leaving the Faces. If you can find that version, listen to it. Ronnie remains one of my biggest inspirations at a time in my life when I’d be hard pressed to name any other idols. I have very few now. But he did things his own way, in his own style, even if it meant throwing it all away. I learned “Traveling the Highway Home” from Ralph Stanley’s Clinch Mountain Gospel album, which is one of my favorite recordings. The song is something of a gospel bluegrass standard– I have a record with Molly O’Day singing a very different version– but the way Ralph does it, with a young Keith Whitley and Ricky Skaggs as members of his band, is special. Though perhaps I’m misinterpreting the lyrics to apply to my own life as someone more or less always on the road, this is often a song I sing to myself on tour. Take one step out of your on front door on a two week run and you’re traveling the highway home, for sure. anyone know how to make these files play on a macbook? Doesn’t work for me on any browser. Is it geofenced or anything like that? Real nice! Solid as usual!